Posted on March 26, 2018 at 12:02 pm. Attorney Omar Ochoa has built a well-established reputation of honesty, straightforward litigation practices and integrity when it comes to protecting the rights of his clients. This is proven by him having taken on successful cases against large corporations and entities in the past that resulted in over $1 billion in combined awards for his clients. His determination and hard work has propelled him into success, but he needed to go the extra mile to make his skills and passion for the law known in the digital world. That’s where we came in. Is your website user-friendly, easily-accessible and appealing? Whether you’re looking to start fresh or overhaul your website, Imagine It Studios can help you stand out from your competition. Contact us today! The first step in excelling online is establishing a visual foundation for your company’s brand. This will help it form its own identity and make it memorable. Your logo is one of the most important elements when developing an online presence, and at our digital marketing agency in McAllen, we work with your logo at any stage. Whether you have an idea of what you’re looking to create or want to start fresh, we can make it happen. “Mr. Ochoa came to us with a concept already in mind. When a client comes to us with an idea and has a clear direction, the creation process really comes to together seamlessly. During each step of the process, he was positive and clear with direction, which translated into his logo. It’s clean, it’s precise and it’s his vision come to life,” said Jaime, our web designer. Each website is different and trying to make it as unique as possible is no easy feat. Whether it’s a logo, for example, overall design or content, careful steps need to be taken to make it stand out in a way that isn’t reflective of something that’s been done before. One of the many things we believe is that a website always sets the tone of a business. 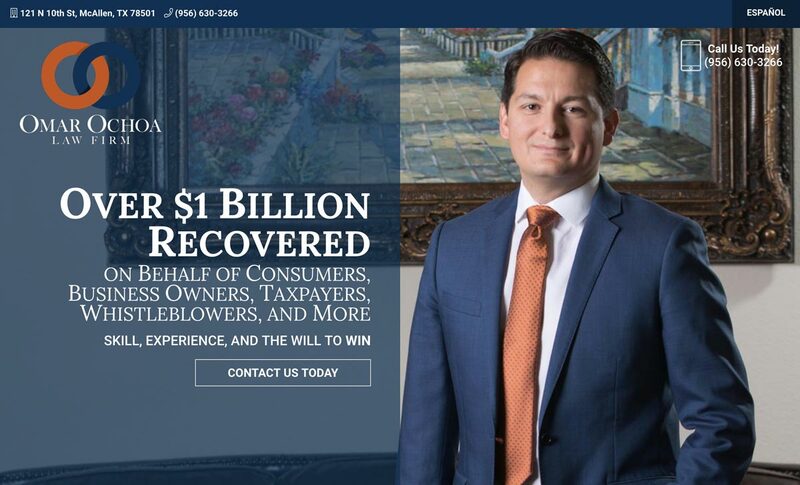 “When we created Mr. Ochoa’s website, we wanted to reflect his success in the legal field. The firm provided great imagery and information that we were able to merge into the site. Our graphic designer, Jaime, created a concept that Mr. Ochoa really liked, and I was able to make it come alive online,” said Cesar, our lead developer. When it came to the content side of the site’s build, an equal amount of care and dedication had to be taken to make everything work and sound unique. With law, things can sound complicated, which is why we had to take careful consideration into how we would translate complex information into content that the average user would understand, all while encouraging potential clients to reach out to Mr. Ochoa for help. “Mr. Ochoa practices several complicated legal fields, so detailing each was a bit of a challenge. However, his feedback was great, helpful and encouraging. He was always available if we ran into some sort of issue. Although many other attorneys work in the same fields as he does, his impressive track record of success makes him stand out, and we incorporated that into the content. Most importantly, we made it easier for users to get in touch with him who needed his assistance,” added Michael, our content manager. The Omar Ochoa Law Firm looks into the details of each case for results that are positive and work in the benefit of its clients. Creating a website is no different. Details are what help you stand out from the rest and assist you in finding success. If you’re looking to excel online, visit our digital marketing agency in McAllen to learn what we can do for you online!